[New for 2011] I couldn't help myself and decided to use my lunch break to see how Stop & Shop is handling all the great new items available for 2011. First I noticed the new Magnum bars from Unilever, and then I spied those Jala froyo bars that Gigi reviewed recently. I wasn't seeing a whole lot else until I got to the end of the aisle. Oh yeah, Stop & Shop is now carrying Talenti! Not only that, but instead of just carrying a few flavors, there are seven flavors in front of me. I'm pretty excited to see Belgian Milk Chocolate, Sea Salt Caramel, Mediterranean Mint, and Black Cherry - Amarena. Had I been headed home, I probably would have went with the black cherry, but since I'm on my own, I can't resist the caramel. 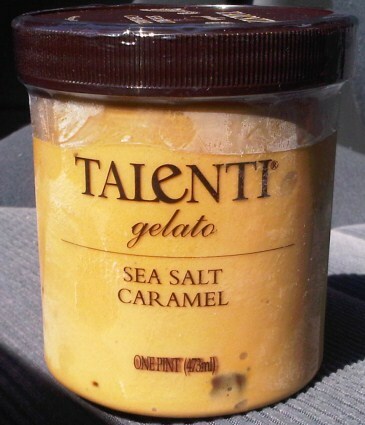 --Cool, I just checked and Sea Salt Caramel is Talenti's newest flavor! That's right, CARAMEL is the first ingredient! 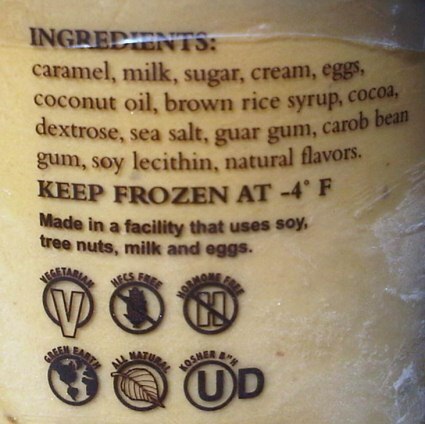 I'm not sure that I've ever seen an ice cream where the first ingredient isn't some form of milk. I had been trying to talk myself out of buying anything, but once I saw that, I was hooked. I wasted no time digging in. I took a few bites and it's definitely not what I was expecting. At first, I'm thinking dry would be the word I use to describe this treat. The Talenti double dark chocolate was kind of dry, but I assumed it was just the cocoa doing it. I took a few more bites and I thought about it some more, and I discovered a better word: tacky. Probably not the most flattering word, but, I'm not really sure it's the most flattering texture either. Check it out. I managed to pull the penny test off in the car. I can't prove it with a picture, but now that I think about it, these cubes very much remind me of the caramel cubes I found in Häagen-Dazs Reserve: Fleur de Sel caramel ice cream. Sounds like an excuse to buy some more H-D Reserve and compare hehehe. Sorry, let's get back to the gelato, in particular, the taste. 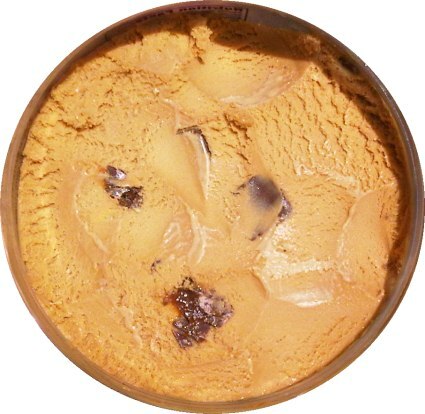 By making caramel the main ingredient, Talenti has managed to create a very uniform caramel flavor throughout the pint. You'll be happy to know it's not an overpowering caramel either, it's fairly restrained. Actually, I'm trying to think if I've ever had a quality caramel that wasn't well balanced. It's sweet but not too sweet, and it definitely wasn't too salty. 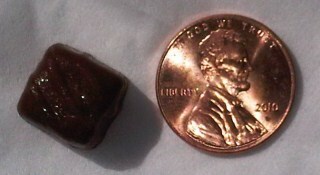 To be honest, I can't think of one other treat that has put this much effort into creating this kind of caramel base. It's a shame that the texture is off... would it be wrong to add whip cream? As I put away the gelato and headed back to work, I tried to sum up my experience and my aftertaste. After a little thought, I just needed one word: Werther's. That's right, this stuff is like eating Werther's Original hard candies. This isn't a bad thing, I like Werthers, it's just funny how much they remind me of each other at the moment. So I don't love this one, and I can only give it a basic recommendation for caramel lovers, but have no fear, I will definitely being heading back to try more flavors... did I mention Talenti is only $4.49 at Stop & Shop? On Second Scoop: Even though I'm sure that the dryness of this one is going to turn a lot of people off, I still like the overall flavor and I still had a little trouble stopping. I stand by my original point that this is very much like a caramel candy and not a caramel ice cream. There's also not a ton of mix-ins which is a shame, they might break up the tacky nature of this treat. Update: I did a match up between this and H-D in 2013, click here for more. I definitely have to try this one! I'm glad you reviewed the caramel. I was on the fence about purchasing it, but now it is a definite future purchase. Oh my god, I remember Haagen Daaz Sea Salt Caramel, and this bumps it up on my must-have list. Thanks! yes... I know gelato is different, I've had it from Ciao Bella, Talenti, and Roba Dolce now. I agree that gelato difference could be contributing to the weirdness, but take my word for it, this one is DRY. Perhaps it's so dry because caramel IS the first ingredient as opposed to milk? I just bought a small container of this at the local supermarket... I loved it. I had some this weekend, and it was to die for! Definitely going to get some more. I am a devoted chocoholic that can not eat chocolate...go figure. Never thought I'd find an ice cream or gelato that I'd like better than chocolate...this is it. If you let each bite melt in your mouth it is devine,just the right amount of caramel and salt. Hate the calories, wonder if you could lighten it up and still maintain the taste. Sea salt caramel has become my Go To flavor. Absolutely love this one. i have had this twice now ... LOVE the gelato, not crazy about the little caramel pieces, i pick them out and leave them on the coffee table lol ... "dry" didn't come to mind, just creamy, dense and yummy!!! that was easily the richest ice cream/gelato i've ever had. if you let it sit out a bit first, you will not find it dry. jeeeeeez. the whole thing coated my mouth and it actually had a gooey texture throughout- not just ribbons of caramel. Disagree that this is dry. This is the best stuff on the planet. I'm finishing one as I type. I must say - I LOVE the texture, especially after 5-10 min on the counter. Ever since I tried this gelato - this is the texture I'm looking for in all other frozen treats now. And the flavor - I agree with every word you said about the flavor. I'm almost always agreeing with your reviews, but not here, this is possibly the best frozen dessert I've ever eaten!! And I've had a lot. Either this or Calder Farms (I'm in Michigan) Chocolate Peanut Butter Ice Cream. I get why the review said dry. It is dry - and very dense - LOVE! Even when it melts, there's a strange(ly deliciously) dry and chewy quality to it. It sure seems different. I don’t have an older container to compare ingredients because the jars are great multipurposed. Just don’t have any older ones! Liked it much better several years ago before the buyout. why not compare your 2017 pint to the 2011 pint pictured in the review? the general consensus is that things have changed (which makes sense when you are owned by a giant conglomerate, in this case, Unilever).